It's hard to believe all the damage that has been occurring in the past couple weeks. From Hurricane Harvey, to the wild fires out west, to Hurricane Irma. I'm sure many people are now having a watchful eye on Hurricane Maria. I have several online friends in Florida, and reading about their preparation for Irma was absolutely nerve wracking. Thankfully, they all came through with minimal damage. My family and friends in South Carolina, are all safe as well. The group of bloggers I met up with to show our support for Hurricane Harvey, is meeting up again in support of those impacted by Hurricane Irma. Sharing food is what we do, so this time sharing a recipe inspired by the Southeastern part of the U.S. or the Caribbean. Please be sure to scroll all the way to the links after the recipe to see what everyone else is sharing! With Florida being in the news so much, I immediately thought "Citrus". And, while these bars are very close to a traditional lemon bar, the variety of citrus flavor coming from Limes, Oranges and Lemons, makes these so much brighter in flavor, and the perfect bar to take on a summer picnic or to a potluck. Or maybe even pack some up in a lunch which is what we are doing this week! Preheat oven to 350 degrees. Line 8x8 baking pan with parchment paper. In medium bowl, mix melted butter, 1 cup flour, 1/4 cup powdered sugar, salt, and 1/2 teaspoon each of lime, lemon, and orange zest. Once combined, press into prepared baking pan. With fork, poke holes throughout crust. Bake for 20 minutes. In large bowl, combine eggs, sugar, flour, and baking powder. Once well combined, add remaining zest, and 2 tablespoons each of lime, lemon, and orange zest. Mix well. When crust is done. Remove from oven. Pour filling over baked crust. Bake for 20 minutes, or until set. Once bars have cooled to room temperature, stir together powdered sugar and 1 tablespoon citrus juice (use whatever juice you have on hand). Add remaining juice as necessary until desired consistency is reached. Pour glaze over cooled bars, let set for 30 minutes before cutting. YUM! I always love things citrusy :-) These bars look wonderful, Kris. These sound absolutely delicious! I love citrusy desserts, especially when it is hot like it has been these last few days again. I guess the good thing about it is all of those green tomatoes are changing a lot faster in the heat wave! I hope you are well and have a great day! Yes, you can't think of FL without thinking of citrus. These horrible storms will be affecting all of us this winter as we are reminded of the devastation each time we look to buy some citrus. I can't wait to try these! I love citrus, and the combination in these bars sound perfect. This looks so good. Perfect FLorida recipe! They look so yummy and refreshing. I need them to go along my citrus shot right now, lol. Thanks for sharing, I can't wait to make these! Oh! I love that you have incorporated all three citrus flavors in this bar! Thanks for raising awareness for this worthy cause! 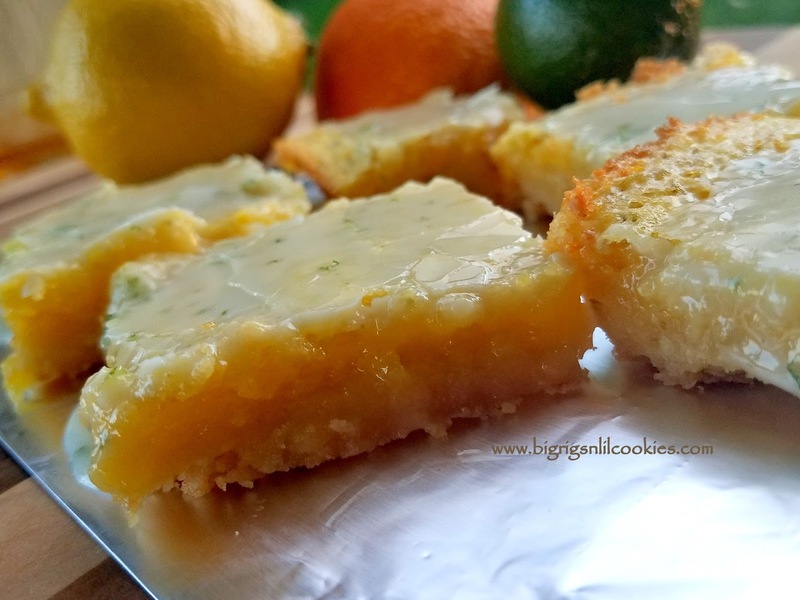 I love lemon bars so these sound awesome! Great use of Florida citrus!! These look so good! I love lemon bars! Yum! Florida Citrus is the best! the perfect theme! i admire your show of support (and i want to eat it, too!)! 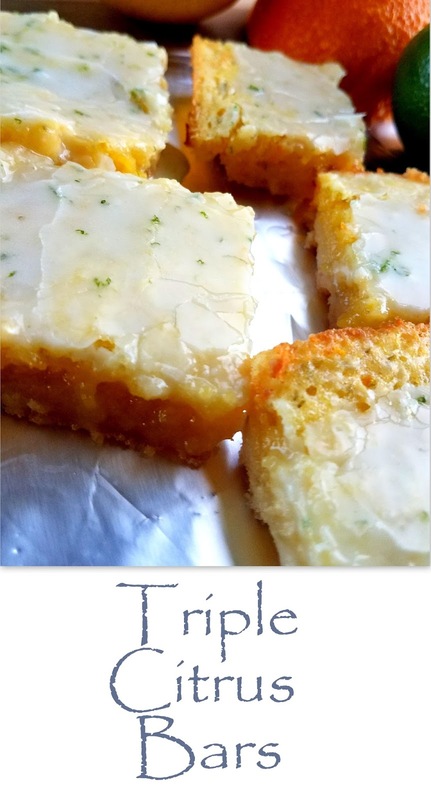 Hi Kris, love everything about these citrus bars, they certainly look delicious! Nice looking bars and I like the idea of the group supporting Florida.